Biochemi cards are great for learning about the four major groups of biomolecules: fats, carbohydrates, nucleic acids, and proteins. 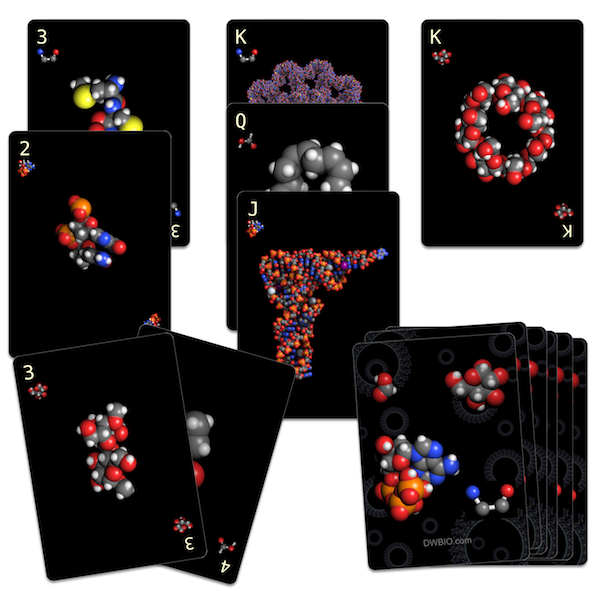 You can play any standard card game with Biochemi cards, just substitute fats for diamonds, carbohydrates for hearts, nucleotides for spades, and proteins for clubs. This deck contains 52 cards plus two key cards for identifying elements in a molecule and identifying suits. 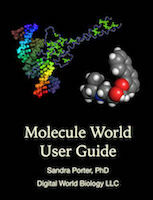 Aces show monomers such as formic acid, glucose, ATP, and methionine. Number cards show polymers of increasing length. For face cards (K, Q, J), we used larger structures from the same four groups with a space filling drawing style. Each card is 2.5 x 3.5 inches in size, the same as standard poker cards. One game we suggest, is Carbs. Carbs is just like the card game Hearts, except in Carbs, carbohydrate cards are used instead of hearts. We also replace the Queen of Spades with the Queen of nucleotides, and start the game by playing a dipeptide instead of the two of clubs. Shoot the moon with Biochemi!